Phew! Been a long time since I posted here, and much has happened. I (and several friends) have been working hard on the aforementioned toy blog, which will hopefully go live very soon. When that happens, BBn will become more of a personal blog. Now onto the real news. As you’ll recall, I proposed to DG back in August. 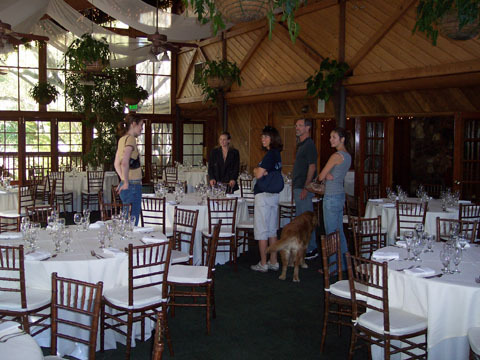 She hails from Simi Valley, just outside Los Angeles, and so while spending the Thanksgiving holiday with her family, we took the time to schedule the big day as well as find a location. The process was mildly stressful, but relieved by the presence of dogs, a trip to Disneyland, and large amounts of turkey and stuffing. 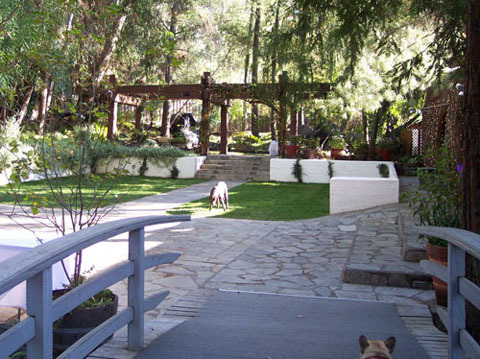 The wedding will be held at a beautiful ranch in Malibu next August. It will be an outdoor ceremony, followed by a reception in the hall next door. 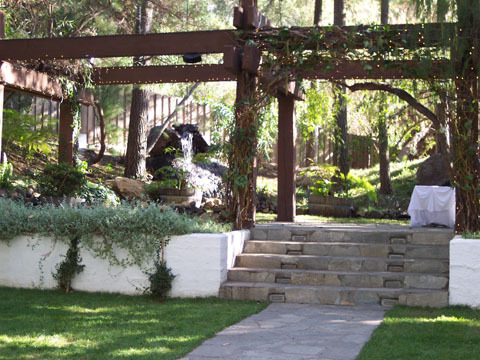 Here’s a look at the garden where the ceremony will take place. The dogs (there’s a French bulldog at the bottom right, too) are native to the ranch but, presumably, not present during the ceremony. Here’s a closer look at the garden. And this is just a small peek at the beautiful, enormous reception hall. We haven’t yet pinned down any other details–including a guest list. But since the wedding will be in Los Angeles, which isn’t exactly convenient for many of our New England-based friends and family, there will be an East Coast reception party at some point as well. I’m not a huge fan of rollercoasters. Or any fast ride, really. Of course, real rollercoaster afficionados wouldn’t probably deign to label the fastest ride at Disneyland as a “rollercoaster,” but they’re plenty fast for me. DG managed to drag me on every single ride that bore a physical health warning (except for Splash Mountain, which was broken). We went on so many rides that I soon discovered the exact degree to which I was comfortable on fast rides: the Indiana Jones Adventure and Big Thunder Mountain Railroad represent the upper limit of what I can handle and still get some enjoyment out of the experience. The Matterhorn, on the other hand, was a bit too intense. Let’s not even talk about Space Mountain. The last time I went to Disney World, I had just managed to work up the gumption to get on Space Mountain when my parents decided it was time to leave. I half-heartedly protested, but secretly I was relieved not to have to test my mettle. This time, I stood in line for an hour and a half in order to spend four minutes in pure, unadulterated terror. The turns were so powerful I could feel the blood rushing from one side of my head to the other, and had a headache for hours afterward. 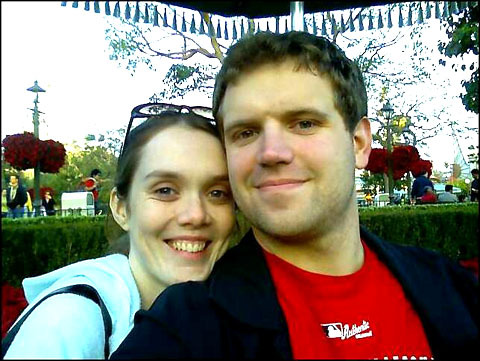 Here we are in happier times, before I came face-to-face with my own mortality on Space Mountain. It wasn’t all rollercoasters and contemplation of one’s death. 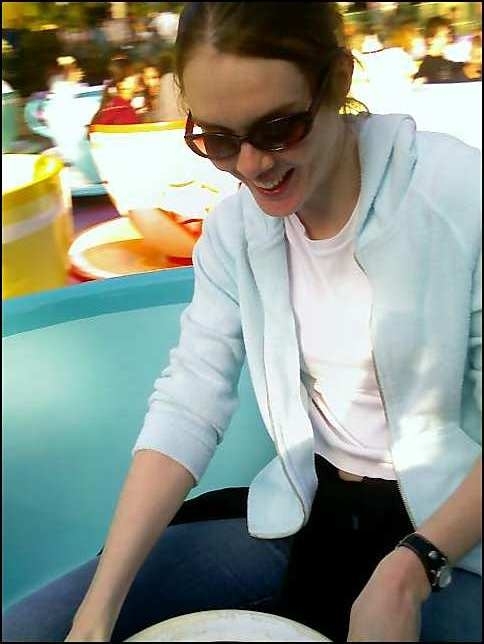 Here’s DG gleefully making me ill on the Mad Hatter’s teacups. But I kid my beloved wife-to-be. I had a great time at Disneyland. The Indiana Jones ride was a blast. I got to visit Star Tours once again (this time around, I noticed that the robotic pilot is voiced by Paul Reubens, a.k.a. Pee-Wee Herman). The Haunted Mansion Holiday was interesting. For those who don’t know, Disney now overhauls the Haunted Mansion ride with a Nightmare Before Christmas theme during the holidays. I was a bit disappointed–I hadn’t seen the original Haunted Mansion in ages and hoped to enjoy it with adult eyes. But it was still cool to experience the NBX-ized version. And the churro was awesome. Since I spent last year with DG and her family in LA, this year she’ll join my family for our Xmas craziness. It began the very weekend we returned, with the annual Christmas Tree Hunt. With a group of family and friends we drove an hour and a half out to Sterling, Mass., where we proceeded to cut down a number of live Christmas trees (DG and I did not get one–our apartment is too small for an unwieldy live tree). At this point, my younger sister is about the only person who’s still as enthusiastic for this trip as she was when we made the first one nearly twenty years ago. A few months ago I posted a note about my friend Andy of Fungible Convictions. It turns out his case was so odd, it made the New York Times. The good news is Andy is nearly fully recovered and will return to work this week. His memory is back to full working order, and there’s no sign of the cancer. Congratulations Andy! No, I’m not talking about that curse. I’m talking about the Curse of the Car. Just after I finished detailing my sordid history with said car, things began to turn around. I found out later that day that, since this is my first moving violation ever, I get a free pass on the surchargeable points. Which means in the end, all I really did by fighting the ticket was get $100 off the fine. But there’s more. One tidbit I forgot to mention was that when I first donated the car to charity, I received a receipt informing me I could only claim $500 as the value of the car on my taxes. I followed this up with a few phone calls, but it seemed I was screwed yet again. Fine, whatever, I said–at least the car was gone. But this weekend, I received a second receipt from the charity, this time telling me I could write it off for almost half what I paid for it used. Plus the Sox won the World Series. Overall, a pretty good weekend.